My son, Tyler, and his girlfriend decided on Dr. Seuss as the theme of the baby's room. They wanted something "gender neutral" which I think is a great idea, even though they found out they are having a girl. My son is definitely not the pink type anyway. Their baby shower was this past weekend, so I thought I would share the quilt my mom made. The center of each block is a Dr. Seuss character and the border is the names of the most popular Dr. Seuss books. 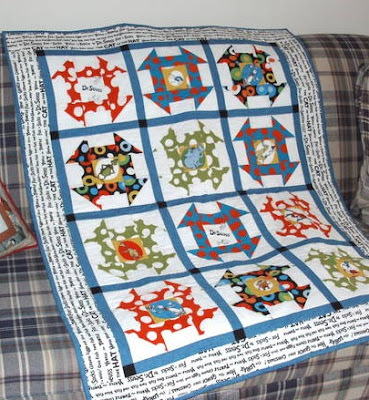 Isn't this quilt fun?!! I did have the same idea, but I knew I wouldn't get it done in time ... piecing I like to do but I'm very slow at the quilting and binding part. I tend to be too picky about my stitching and tear out more than I put in. Anyway, I knew mom would do a great job!